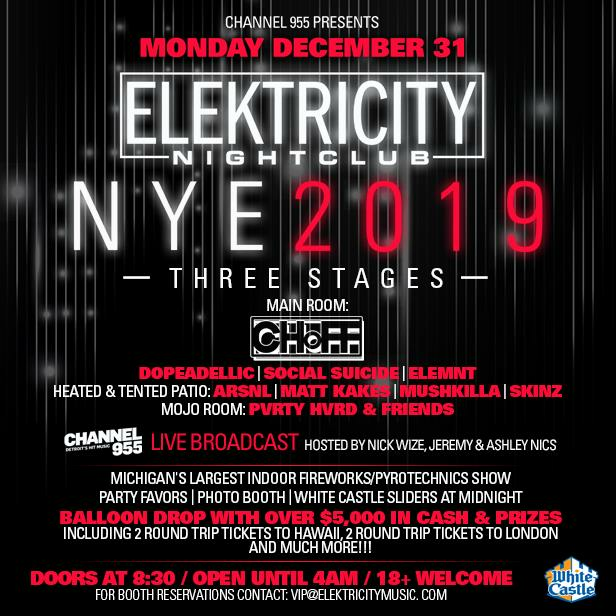 Channel 955 presents NYE 2019! Featuring Michigan's largest indoor fireworks/pyrotechnics show! Complimentary White Castle sliders at midnight! BALLOON DROP with over $5000 in cash & prizes!!! Prizes include: round trip tickets to London, round trip tickets to Hawaii, Red Wings tickets, Pistons tickets, Pistons sportswear, autographed Red Wings player pucks, autographed Tigers baseballs, tanning packages, a day at the spa, body makeovers, teeth whitening, L.A. Fitness memberships, MJR movie passes, Hustler VIP, Trumpps VIP, Mt Brighton skiing, Pine Knob skiing, gifts from Intimate Ideas, books, DVDs, cash, as well as gift certificates for: Capital Grille, Granite City, Mitchell's Fish Market, Famous Dave's, Hooters, Duggan's Irish Pub, Lone Wolf Paintball, CJ Barrymore's, Forever 21, and so much more! Open and serving until 4am!